LOCATION.--Lat 43°01'50", long 73°55'38" referenced to North American Datum of 1983, Saratoga County, NY, Hydrologic Unit 02020003, on left bank at upstream side of bridge on County Highway 49, 0.5 mi south of West Milton, 1.5 mi upstream from mouth, and 4.0 mi northwest of Ballston Spa. PERIOD OF RECORD.--April 1948 to June 1963, October 1990 to current year. GAGE.--Water-stage recorder and crest-stage gage. Concrete control since June 20, 1952. 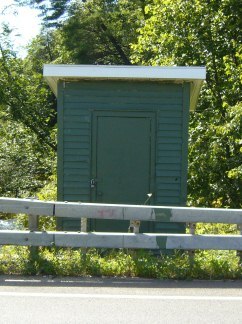 Datum of gage is 407.22 ft above NGVD of 1929 and 406.70 ft above NAVD of 1988 (VERTCON). Prior to Aug. 27, 1948, nonrecording gage at highway bridge at same site and datum. REMARKS.--Since May 1955, groundwater pumpage by the Knolls Atomic Power Laboratory, West Milton site, enters Glowegee Creek upstream from station. EXTREMES FOR PERIOD OF RECORD.--Maximum discharge, 1,670 ft³/s, Dec. 31, 1948, gage height, 7.04 ft (prior to concrete control); maximum gage height, 7.12 ft, Jan. 8, 1998; minimum discharge, 0.37 ft³/s, Aug. 10, 11, 1949, gage height, 0.67 ft (prior to concrete control).